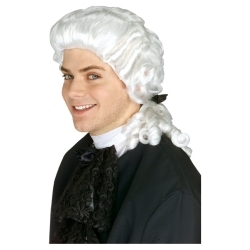 This colonial man wig is an quality wig at an affordable price. The colonial man wig is available in either brown or white and can be used for book reports or school projects. The white wig is perfect for creating colonial period characters such as George Washington or Thomas Jefferson and the brown is perfect for Gaston in "Beauty and the Beast". Wig is one size fits most children and adults using an elastic sizing band on the inside of the wig.